Pipe cleaners were one of my daughter's favorite mediums when she was little. She still likes getting a pack every so often to make sculptures. Add that to the fact I'm a craft stasher, and I found a box of 100 green pipe cleaners while I was organizing the other day. Green, and it's nearly Saint Patrick's Day, so I thought "Shamrocks!" These can be hot glued to pin backs or hair clips. So I told Dea if she wanted to make some shamrocks, I'd post instructions. I made one as well. Mine wound up being a lot more complicated than her's. She made 3 and instructions for the other 2 are coming after she shows me how she made them. First the basics- How to make a spiral. Start by curving the end of the pipe cleaner around a pencil or pen. Then you'll hold that circle flat between you'r thumb and index finger. Hold the end of the wire with your other hand and turn the circle to spiral the wire around that center. Adjust your hold as necessary until you have a spiral the size that you want it. You can spiral as tight or as loosely as you'd like. So now you know the basics of making a spiral. Let's start with Dea's shamrock. Take 2 pipe cleaners, and twist them together in the middle. Spread the ends so they form an X shape at right angles from each other. Now spiral 3 of the ends in the same direction. It looks a lot like a triskele. Trim the bottom wire or use it to twist around something to create an accessory or gift. Mine takes 4 pipe cleaners. Bend 3 of them in half and open them out to about a 90 degree angle. Spiral the ends towards each other to create open heart shapes. With the 4th pipe cleaner, starting about halfway down the sides of the hearts, wrap it around the sides of 2 of the hearts to join them together. Then form a loop for the stem. Now wrap it around the sides of the heart on the opposite side and the middle heart. You can trim the wire at this point, but what I did instead was bring the wire back down the stem, and wrap the stem. Use hot glue or E-6000 to attach the shamrock to something. No pinches! These are wonderful! I'm often discouraged about what I find in stores for St. Patty's day. 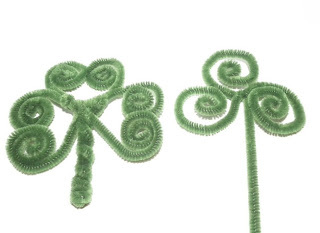 I do find unique items on Etsy and Ebay sometimes, but I really like the vintage look these pipe cleaners have when made into shamrocks. Thanks for sharing! I'm so glad you like them! Marian Call concert last night + a drawing!